What is Axialis Lifetime License? 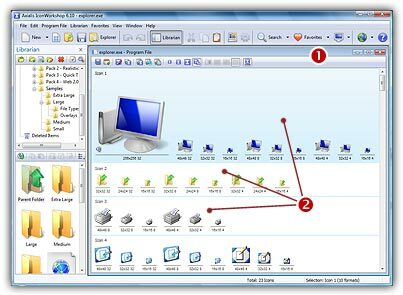 • Visualize, Modify, Export, Copy in Clipboard and Add to the Librarian any icon included in a program file. • Save your changes in the same file or export it to icon files or ICL. • Add or delete icons. • Add or delete image formats in icons. IMPORTANT: We strongly recommend to make a backup/rescue copy of the original program file before modifying it using this feature. The file may be corrupted during the operation. 1. Choose File/Open and select a program file EXE, DLL, OCX... You can also open an Explorer window (Ctrl+E) and double click on a program file. 3. To modify an icon just double click on it or select it and press Enter. 4. The icon opens in an editor window. Just modify it as if it was a standard icon file (don't forget the above limitations though). 5. When done, update it by choosing File/Save or press Ctrl+S. Close the editor window. 6. The icon has been updated in the list (if you modified the displayed format). 7. Repeat steps 3 to 7 for other icons if necessary. 8. Update the program file by choosing File/Save. 2. The program opens in a document window displaying all the icons it contains. 3. Select the icons you wish to extract. 5. Select the destination folder and click OK.
6. The icons are extracted as ICO ( : ICNS, RSC, BIN as chosen). 3. Select the icons you wish to add to the librarian. Choose File/Add to the Librarian or press F3. 4. A dialog box opens. Choose either to extract them as separate icons (ICO) or to create an icon library (ICL). 5. Click OK. The icons are extracted as requested. 4. The icons are immediately added to the selected library. Copyright © 2019 Axialis SA - All rights reserved.